I currently DO NOT ACCEPT bids/ship to GERMANY, ITALY, RUSSIA and all of SOUTH AMERICA. SORRY!SHIPPING OUTSIDE THE U.S. for this lp will be at least $50 so that it can be shipped EXPRESS MAIL INTERNATIONAL with tracking and insurance due to it's high value! Payment is expected in 3 days. If you need a bit more time, please contact me. I combine shipping. If you have any problems whatsoever with a transaction please contact me before leaving feedback and I'll do my best to make things right. Vinyl and inner sleeve are are always removed from jacket and are always put in protective plastic sleeve to protect jacket from splits in preparation to ship.Buyers with less than 20 feedbacks should contact me before bidding for approval or your bid may be cancelled! If you there is any confusion or you have questions with items I have for sale, questions about my shipping rules or questions in general be sure to contact/clear them with me prior to bidding. For any return or refund, item must be returned in same condition as listed in my auction (i.e. if the record is described as "sealed" or "mint" it should not be opened or in lesser condition than described in my listing when shipped back). 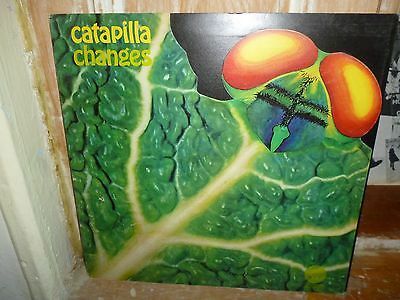 Up for grabs in a really great and super rare ORIGINAL U.K. PRESS prog lp by CATAPILLA entitled CHANGES (VERTIGO 6360 074, 1972). ORIGINAL DIE-CUT JACKET IS IN VG TO VG+ CONDITION; MINOR SEAM/SPINE/CORNER DINGS/WEAR, SMALL LESS THAN AN INCH TEAR NEAR BOTTOM OF BUG'S LEFT EYE (SEE PHOTO), MINOR SCUFFS ON FRONT AND BACK OF JACKET & FAINT RINGWEAR FRONT AND BACK OF JACKET. NO SEAM SPLITS AT ALL! REALLY PRETTY AMAZING SHAPE CONSIDERING IT'S AGE! VINYL IS IN EXCELLENT CONDITION; REALLY SPOTLESS LOOKING VINYL -- SUPER CLEAN/SHINY! PLAYS GREAT WITH FAINT SURFACE NOISE (REALLY ONLY NOTICEABLE IN QUIETER SECTIONS OF THE LP). REALLY THE NICEST COPY OF THIS YOU ARE LIKELY TO FIND ANYTIME SOON! ALSO, INCLUDES ORIGINAL VERTIGO INNER SLEEVE IN NICE SHAPE; MINOR CREASING & SOME BROWNISH AGE DISCOLORATON. If you have any questions about this lp (or the other CATAPILLA lp I have up) please ask questions BEFORE bidding! If you need to see more photos feel free to ask and I will send! Be sure to check out the 1st CATAPILLA lp I have up also! Also, and ORIGINAL 1ST PRESS U.K. VERTIGO!